Our ID Package with vest, patches and photo ID clearly identify your service dog anywhere in the US. 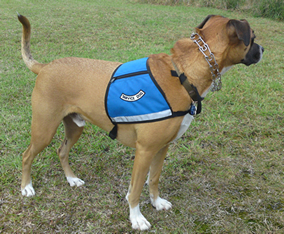 Service Dogs America provides the latest in Service Dog equipment. Including vests patches collars leashes wallet cards collar tags tempo harness walking harness. The term Service Dog encompasses a broad range of assistance animals that have been trained to assist their owners with their disabilities. The Americans with Disabilities Act (ADA) requires public and privately owned establishments serving the public, such as restaurants, hotels, retail stores, taxicabs, airplanes, theaters, concert halls, and sports facilities, to allow people with disabilities to bring their service animals onto business premises in whatever areas customers are generally allowed. in America may have some form of disability. Most persons rely on their dog to assist them in many different ways. Ensure your dog will be allowed to accompany you wherever you need to go by clearly identifying him/her as a service dog with an Service Dog Identification Package provided by Service Dogs America. Many individuals rely on their canines to help them in a variety of ways. To ensure that your canine can accompany you wherever you go, it is imperative to clearly identify them as a service dog. 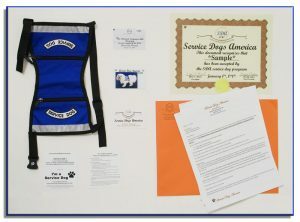 Service Dogs America offers identification packages to ensure your pooch goes wherever you go. There is NO legal requirement in the United States for a Service Dog to be trained by a Professional Trainer in order to have "public access" rights. For some reason, Service Dog organizations intimate that ONLY dogs professionally trained have public access rights. A disabled person has the right to train his or her own Service Dog, either with the help of a trainer or without. At Service Dogs America, we want to provide you and your canine everything you will ever need to be accepted in society. You will not have any difficulty as long as your dog is trained and behaves. Meet Brut, an owner trained service dog. Complete with vest patches, collar, leash, collar tag, certificate wallet card. Our Service Dogs America team maintains a help desk 24/7 (808) 291-0429 for the benefit of our clients. We answer questions and have a network of associates to assist with any situation you may encounter. First of all Paul with Service Dogs America gave me excellence service, helpful & kind and always there for us. I have had Maya my husky mix as my service dog with Service Dogs America for 4 years. I took Maya to brazil 2014-2015 for 6 months and we just returned to the USA. We had easy flight on American Airlines we had our own seats, easy entrance through custom into brazil. Then I brought Maya and my border collie puppy back to USA with an easy entrance with her service dog card & vest. My new puppy Francisco is in training under Maya now and he is also a service dog. We are so grateful. Thank you so much Service Dogs America.